which extend the transmitting distance of E1 signal greatly. E1 signal support framed and unframed mode. When in framed mode, continuous or discontinuous time-slot can be selected. 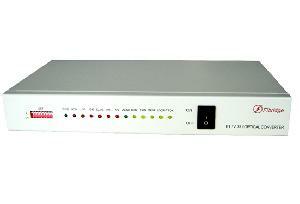 E1 fiber modem and V. 35 fiber modem can be used together. Both of them are widely used in extending user interface in ATM or DDN. 4, Three loop back mode selectable: Local loop back, diagnostic loop back, remote loop back.